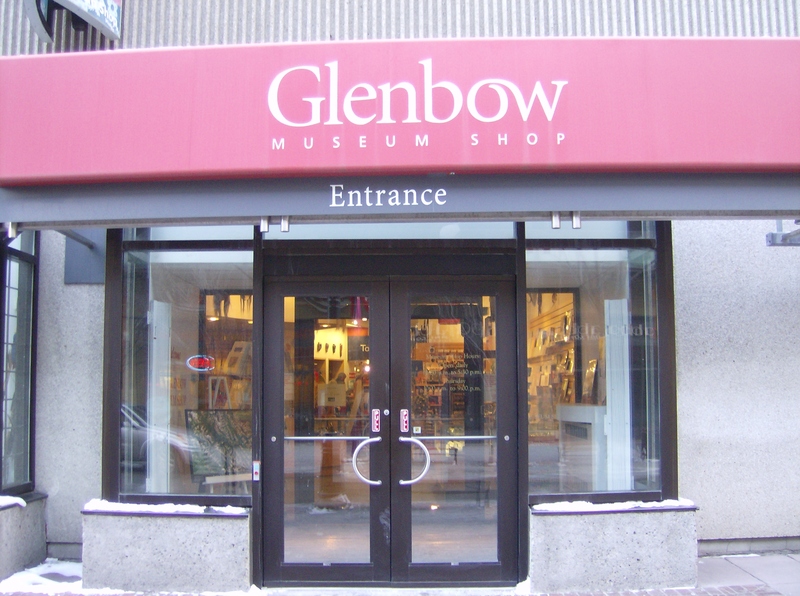 We spent the day today with Janine, Micah, Vienna, Peanut, Sage and Soleil at the Glenbow Museum. We took the bus downtown, then met Janine and the kids at Caffe Rosso. Had a delicious soy latte there and hung out for a bit before heading across the street to the museum. We immediately saw the activities in the art room (artwork in the style of the Brian Eno exhibit, slides, and tracing/layering/colouring) and wanted to get started right away, but decided to take in the related exhibits first for context. The Brian Eno exhibit was neat but Neko decided she was scared of the music and the dark, so we went to the Biotechnology exhibit next door. There was a neat person-sized piece showing a blastocyst, glowing in the black light. We learned that amber glows in the black light, too. Neko and I checked out the difference perspective makes in your experience of art – a painting looks very different from far away than it does up close. There was also a neat walk-through piece that was like being inside a giant kaleidoscope. We made our way to the art room to colour some Brian Eno-esque drawings, which was a lot of fun. This was great practice in making patterns. By the time we finished, the room was closing for the lunch hour and we decided we were hungry. We strolled down Stephen Avenue to TD Square and ascended four escalators to get to the food court, where we all shared pad thai, sushi and a veggie sub. Here (in the bathroom), Neko and Micah learned about elimination communication from Peanut and Soleil. We slowly made our way back to the museum and headed back to the art room. We spent at least another hour in the art room, first making slides, which the attendant projected onto the screen for us. It was neat to see our images blown way up, and then to see what they looked like overlapped. Then we tried out the light table with a variety of transparencies on it, which we traced onto vellum, overlapping images. We then coloured these images and viewed them through the lightbox. We spent a ton of time at this activity. Janine, Micah and Vienna decided to go home, and after wandering a bit more, Peanut, Sage and Soleil did as well. Neko and I then took in the Rocks and Minerals exhibit, the Africa exhibit, Historic Paintings of Canada, and the Brian Eno 77 Million Paintings exhibit and Stephen Hutchings: Landscapes for the End of Time exhibit each one more time. The latter was my very favourite of the day – so beautiful!